The creation and development of a powerful brand name will help the “tra” fish sector secure a firm foothold in export outlets, especially the European Union (EU), suggested experts. Deputy Head of the General Department of Fisheries Pham Anh Tuan said the EU is an important market for the tra fish industry. The recent reduction in imports from the market reflects economic recession, but EU countries still need Vietnamese tra fish products in the long run, he added. Alfons van Buivenbode from the EU’s Centre for the Promotion of Imports from Developing Countries said European customers are concerned about genuine nutrition information and ingredients of the product on the labels and packaging, including the code to trace the origin of the product, from Vietnamese processing and export firms. Determining the optimal pricing is also important, according to Director of the Cleaner Production Centre under the Hanoi University of Science and Technology Le Xuan Thinh. He suggested businesses study technology transfer to farmers to reduce production costs, citing up to 80 percent of food material for tra fish are imported from overseas. Meanwhile, Chairman of the Vietnam Fisheries Association Nguyen Viet Thang recommended enterprises diversify processed products to increase competitiveness. Thang highlighted the need for the tra fish sector to satisfy consumer requirements to stand firm in both easy-going and choosy markets. Currently, Vietnamese tra fish products are being sold in 128 markets, nine markets fewer than last year. According to the General Department of Customs, seafood export turnover had reached over 3.84 billion USD by August this year with shrimp, tra fish and bivalve mollus as staple products. As of the mid-July 2015, the tra fish sector alone had grossed 814.67 million USD from exports, a year-on-year decline of 8.8 percent. Major markets such as the US, EU, China, other ASEAN member states, Mexico, Colombia, Canada and Australia made up over 72 percent of the sector’s total export value. Among the markets, only the UK increased its imports of Vietnamese tra fish to 25 million USD, up 41 percent over the same period last year. Some have attributed the decline to the sector’s failure to build a brand name and improve the quality of its products. 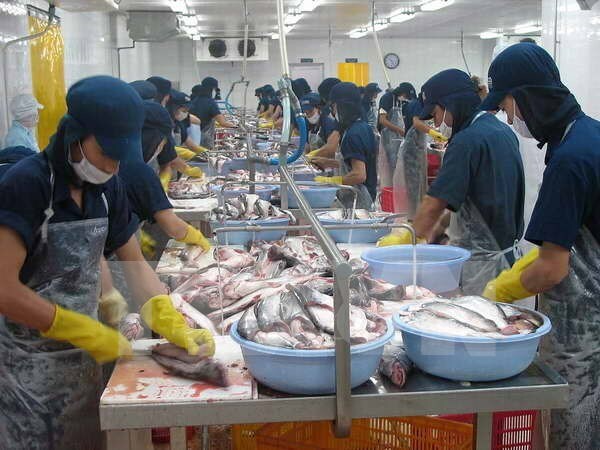 Deputy Director of the Vietnam Association of Seafood Exporters and Producers Le Hang cited regional economic downturn and EUR and USD exchange rate fluctuations as reasons behind dwindling tra fish exports in the first half of this year.